Sculptra® is an FDA approved injectable cosmetic filler that can be used to treat deep lines, creases, folds, and wrinkles, restoring facial volume and resulting in a more youthful appearance. Sculptra® works subtly and gradually over time, providing results that are natural and seamless. Sculptra® treatments stimulate your skin’s own natural collagen production to help restore its inner structure and increase the facial volume that has been lost to aging. Sculptra® addresses the underlying cause of facial aging (lack of collagen), not just the symptoms! The main ingredient is poly-L-lactic acid which stimulates your skin’s own natural collagen production to help restore its inner structure and increase the facial volume that has been lost to aging. How many Sculptra® sessions do I need? The amount of treatments that you will need, as well as the amount of vials needed per treatment, varies drastically based off a number of factors including patient age, injection location, facial symmetry, and facial fat content. Most patients receive 2-4 Sculptra® treatments, but our providers will work with you to determine how many treatments are necessary to achieve the look you want. 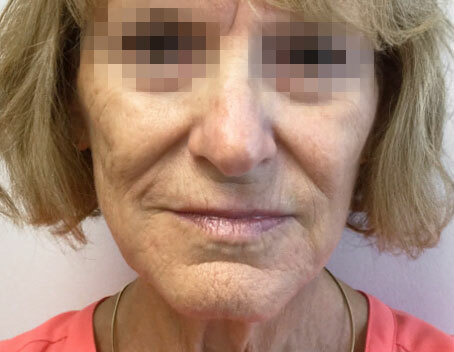 For older patients or those with asymmetrical features, more treatments may be required. How long do the results from Sculptra® last? It can take 2-3 months for patients to see the full results from their Sculptra® treatment, but once treatment is completed the effects from Sculptra® are long-lasting. Most patients report results lasting up to two years, with minimal continued treatment (usually once per year) required to maintain results. Like with any procedure, some patients may report experiencing discomfort during Sculptra® treatment. Our team of providers uses numbing cream prior to treatment to ensure that our patients have as comfortable and pain-free of an experience as possible! Sculptra® is a noninvasive medical procedure that requires specific training, knowledge, and skill to ensure safe and natural-looking results, so you want to make sure that you choose a provider who’s been trained appropriately. Academic Alliance In Dermatology has certified providers who specialize in Sculptra® at several of our 18 office locations. Call us at (813) 514-4711 or fill out our online form to book your appointment now.